Discover the heart of Mexico's interior with its picturesque historic colonial cities which have some of the finest and most majestic examples of colonial architecture in the new world. Step back in time to the colonial era when Spanish influence thrived among elaborate baroque palaces and cobblestone streets along tree lined shaded plazas. Mexico's Colonial Heartland calls to mind emotions of liberation and revolution and today is still looked upon as a foundation of national pride. 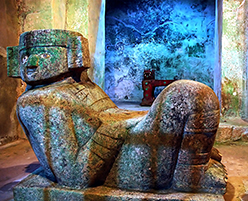 There are fascinating archeological sites; Mexico is the land of the Mayans and the Aztecs who left behind ruins of cities that tell of their amazing civilizations. Today's bustling capital, Mexico City, is one of the world's most populated cities and built over the ruins of the capital city of the Aztec empire, Tenochtitlan, making it one of the oldest cities in the Americas. You will find a true melting pot of history and culture where the ancient past and contemporary present blend to create a unique city which has a firm foot in both worlds. As you travel further south to the Yucatan you will enter the heartland of the ancient and complex Mayan culture where you can take a glimpse into the ancient Maya world as you walk in the footsteps of civilizations past, discover the treasures of Chichen Itza, some of the most finely restored ruins in world and go in search of ruins still covered in dense jungle, waiting to reveal new hidden mysteries. For those who enjoy wonderful natural scenery, travel to the mountains of Southwest México and Oaxaca's rock-strewn countryside which is set against a backdrop of crystal blue skies which form vistas and landscapes that are found nowhere else in the world. Together with the unique combination of lush tropical forests and temperate zones this region is the most biologically diverse state in México. With its extensive indigenous populations, you will have an insight into its rich cultures and find unique handicrafts and weavings, as well as enriching visits to local ruins and historic churches. 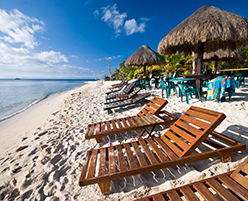 Mexico is a great destination to visit throughout the year, though the peak season is July to August when many Mexicans take their annual holiday. On the high central plateau, in cities like Mexico City, the weather is mild throughout the year. Inland, northern Mexico is mostly desert, hot in the day and cold in the night. The country's central pacific coast and Yucatán Peninsula is hot, sunny and humid almost throughout the year but, in the late summer months, heavy rains come with the hurricanes. From London to Mexico City is 11 hours 40 minutes; From London to Cancun is 10 hours 40 minutes. Direct flights are operated by British Airways. GMT -6 (GMT -5 from first Sunday in April to last Sunday in October).